Do all paleontologists believe that birds and dinosaurs are related? No, not all paleontologists believe that birds are dinosaurs or even that birds evolved directly from dinosaurs. Many suggest that birds and dinosaurs descended from a common, older ancestor, and developed many superficial similarities over millions of years due to convergent evolution; because they both developed body designs for bipedal motion, they eventually started to resemble each other. There are four major reasons why some scientists think there is not a direct dinosaur-bird link: the timing problem, body size differences, skeletal variations, and the mismatch in finger evolution. First, with regard to timing, there is some fossil evidence that bird-like dinosaurs evolved 30 to 80 million years after the Archaeopteryx lithographica, which seems to put the cart before the horse, or the bird before the bird-like dinosaur. This is the opposite of what you would expect if birds descended from dinosaurs. Second, some scientists suggest it was nearly impossible for theropods to give rise to birds because of differences in body size. They point out that these carnivorous dinosaurs were relatively large, ground-dwelling animals, with heavy balancing tails and short forelimbs, not the sort of body that could evolve into a light-weight, flying creature. Third, although birds and dinosaurs have skeletons that appear similar at a macroscopic level, there are really many variations on a smaller scale. The teeth of theropods were curved and serrated, but early birds had straight, unserrated, peg-like teeth; dinosaurs had a major lower jaw joint that early birds did not; the bone girdle of each animal was very different; and birds have a reversed rear toe for perching, while no dinosaur had a reversed toe. Fourth, there is a discrepancy between the fingers of dinosaurs and birds. Dinosaurs developed hands with three digits, or fingers, labeled one, two, and three, and corresponding to the thumb, index, and middle fingers of humans. The fourth and fifth digits, corresponding to the ring and little fingers, remained tiny vestigial bumps, which have been found on early dinosaur skeletons. However, as recent studies of embryos have shown, birds developed hands with fingers two, three, and four, corresponding to the index, middle, and ring fingers of humans. Fingers one and five, corresponding to the thumb and little finger, were lost. Some paleontologists wonder how a bird hand with fingers two, three, and four could have evolved from a dinosaur hand with fingers one, two and three. And they say the answer is: It’s impossible. 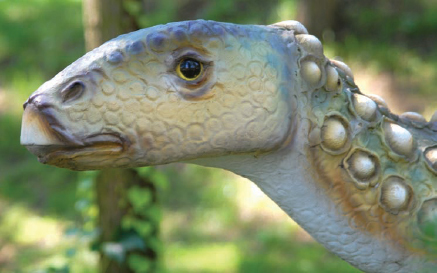 This Scelidosaurus harrisonii had a bird-like beak instead of teeth. Beaks in some dinosaurs are one reason some paleontologists see parallels between dinosaurs and modern birds (Big Stock Photo).